– Giới thiệu: Andritz is one of the leading suppliers of complete systems for deinked pulp. As far as flotation is concerned extensive know how exists basing on the huge experience since Andritz installed fist DIP line in 1978. 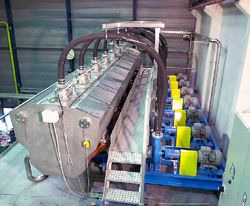 Since July 2002 Andritz has been supplying an own new flotation technology – the SelectaFlot™. The SelectaFlot™ combines well-proven flotation technology with revolutionary aeration elements to one unbeatable flotation unit. Flotation is the process for ink removal and other hydrophobic particles in recycled fiber pulp, besides exists only washing, a process which is not often implemented nowadays. 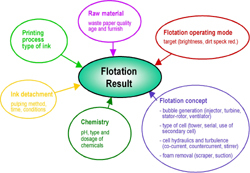 In general flotation is influenced on the one hand by physical parameters as ink particle size, particle density, bubble size, temperature, consistency, as well as current conditions inner the flotation cell and on the other hand by chemical parameters as pH, chemical types, and quantities. An ideal flotation process is guaranteed by a perfect hydraulic design as well as of a specific adjusted composition and quantification of deinking chemicals. Pulp suspension, the insert and distribution of air, the mixing of the aerated and the non aerated pulp, the ascent of the air-ink agglomerates and last but not least the foam discharge are pretended by the design of hydrodynamic conditions. Optimal hydraulic cell geometry guaranties a complete mixing of aerated and non-aerated pulp, a sufficient distribution of deinking chemicals, as well as the collision of ink particles with air bubbles. Flotation is a process, which is dominated by surface property, the hydrophobicity, which can be adjusted by selective adsorption of chemicals. Properties, which go along with physical variables like mass or volume, are dominating the further flotation steps. Several deinking chemicals are used to improve the efficiency of ink removal. Relative small ink particles are hydrophobizied and also agglomerated to floatable agglomerate-sizes by collecting chemicals. Ink particles are floated due collision with gas bubbles and attachment on air bubbles to the surface, where a foam layer is formed. In general flotation is effected at approx. 1,2 % inlet consistency. 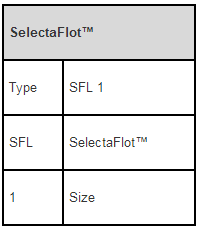 In a standard layout design the SelectaFlot™ flotation cells are arranged in series, with 5 cells in the primary and 2 cells in the secondary stage as standard design. For the reduction of fiber loss, a secondary flotation stage treats the foam of the primary stage. A defoamer – the FoamEx – mechanically destroys the foam from the primary flotation before secondary flotation cells are fed with this stock. The accept stock from the secondary cells is fed back to the first primary cell. Foam from secondary cells is piped to a tank and pumped to the sludge dewatering unit.